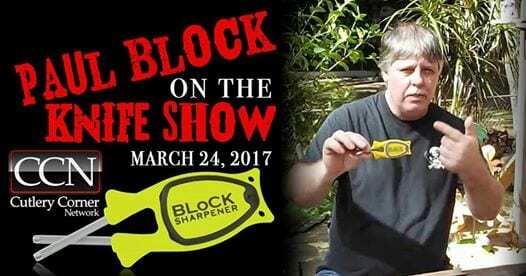 Block Knife Sharpener are a New Patent American made knife sharpener that is quick and simple to use. Have No fear of losing your knives original cutting edges. Or what’s already there. 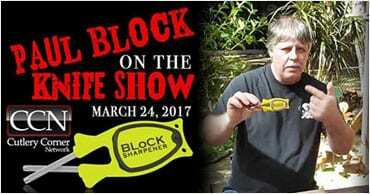 Block knife sharpener has a Patented Flex design made to pick up on any knifes original cutting edges. So you can only get your knife sharper when drawing knife blades threw the knife sharpener. 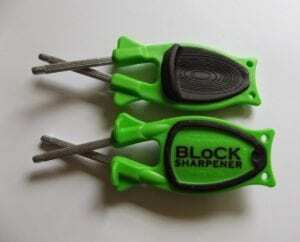 Block knife sharpeners Takes very little to no steel off knife, Yet you will get knives razor sharp quite fast. 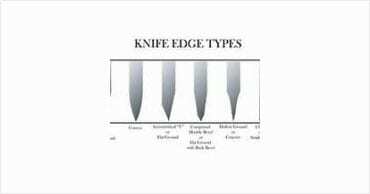 We have how to videos on how you can sharpen different kinds of cutting edges and knives on this website. We sharpen any style serrated edge knives, Pocket knives, Kitchen knives, Fixed blade knife, Swords, Hatchets, Scissors and lots of odd shaped cutting edges found around the house. Made in America Knife sharpener Patent Number D778705. It’s neither difficult nor time-consuming to sharpen a knife. Here is a quick demonstration of just how quick and easy it can be to restore a dull knife so that it’s razor sharp. See more how to use our sharpener videos on this site or on our Youtube channel. We will teach you everything there is to know about sharpening with this unique patent sharpener. New updated technology Anti-Slip Grip Thumb Guide as seen in the yellow gives you great control and Grip. When using knife sharpener free hand out doors. We also add the patent slip grip ring around our last name on bottom side of our sharpeners to help you grip tight on flat surfaces you may work it off of. Block is our last name. We are American made knife sharpener and offer a lifetime guarantee, We have free shipping anywhere in the world. Money back guarantee. More sharpeners you order the better the deals get. We thank you for your business owners Billie Jo & Paul Block. Block's Knife Sharpener Unique Patented Flex Design allows it to pick up on many odd cutting edges that other knife sharpeners cannot sharpen. Block sharpener sharpening rods are a specially Formulated hi Rockwell butcher steel precisely set in our sharpeners and made to flex open, and adjusting to your knife original cutting edge, taking out the guesswork of sharpening. Block knife sharpeners come in two styles, Original starting at $19.99, and New patent Model with Anti-slip grip, start at $24.99, Both work same. New models are much easier to use do to the New Patent Anti-Slip grip and thumb guide. Free shipping any destination in the world. The more you order the cheaper new models sharpeners are, 2 for $16.00 each, 3 - 12 for $13.00 each. 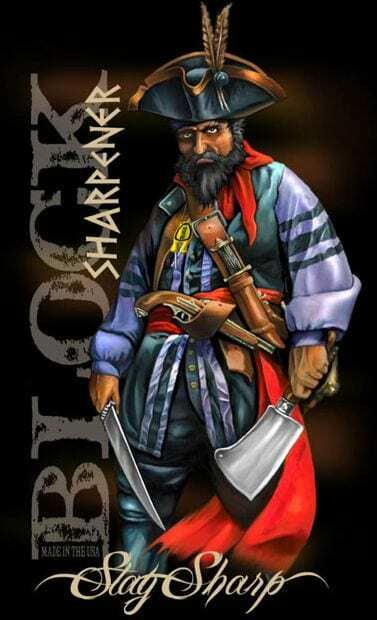 The Block Sharpener has earned the reputation as the #1 Best knife sharpener around the world by providing a quality product that has become the preferred choice for many professional chefs, hunters, fishermen, scouts, military personnel, and everyday people. I was examining some of your content on this internet site and I believe this web site is rattling informative ! Keep on posting . 5.0 out of 5 starsThe best and quickest knife sharpener ever! I bought a model similar to this one years and years ago at a gun show. Finally it had seen better days, and I was super excited when I found this on Amazon. The one I got works even better than the old one. 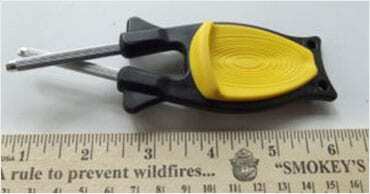 It is very heavy duty and has a rubber grip to prevent slipping. I am an avid home cook, and I have a 13 year old set of kitchen aid knives. This keeps them perfectly sharp to the point where if I simply bump one accidentally with my hand it’ll make a razor type cut on the skin. I use it for all my kitchen shears as well. Sharpening is very quick and always precise and perfect. 5.0 out of 5 starsGreat sharpener! After watching reviews of this sharpener I decided to give it a try. 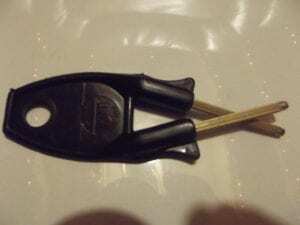 I worked as was decribed and performed as well and better than some more expensive sharpeners. Works for my needs will purchase more great shop and tool box accessory small portable and works great. To get aore honed edge need to run blade over leather strap or old leather belt. If you follow simple instructions you will get a great edge back on your knife! I liked it so much that I bought another. I am going to buy more in the future for gifts for friends and family. I am very impressed with it. Perfect for around the house or in the field. It works. It will not mark up your blade. If it scratches your blade you are doing something wrong. I highly recommend this product. Very pleased. In less than a half hour, I had every knife and scissor in the house razor sharp. I went to the website to see how to use depending on the blade style. © 2018, Blocks Sharpener. All Rights Reserved.